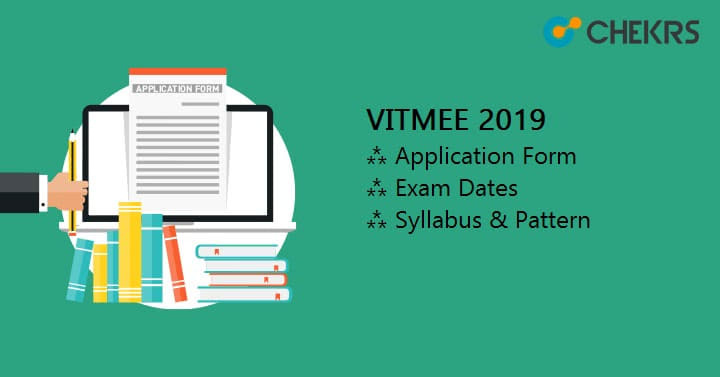 VITMEE 2019: VITMEE is the exam associated with VIT admission process. The university offers courses and admission in UG, PG and research level programs, however, accepted by analyzing the performance of students in entrance exams. VITMEE Exam is for admissions in M.Tech programs offered in different schools of the university. Here in the article below you will find details through which it is easy for all the aspirants to gain knowledge of VITMEE Application Form, eligibility criteria, important dates of all events, exam pattern, syllabus and other pre and post-exam related helpful information. Important dates are aligned here in a queue so that it will be easy for each candidate to applying to prepare their schedule accordingly. Eligibility is the generalized criteria usually applied to get enrollment, However eligibility sis set so that better preparation can be done and best opportunity can be fetched. The aspirants are permitted to appear in the entrance exam only if they have fulfilled the minimum requirement of taking admissions. Thus, it is important for all to posses information of VITMEE Eligibility Criteria to avoid inconveniences. Check out the list of VIT M.tech Eligibility. Age limit: No maximum age limit. Educational Qualification: BE/BTech Degree in the relevant field of applying. Min. Marks: Candidates should have secured minimum 60% aggregate in graduation. Note: Students who have other degrees such as B.SC are also not eligible. The VITMEE Application Form for appearing in the entrance exam will be accepted by the university only if deposited on time. Also, following the correct procedure is must if not the chance might be missed. To avoid such we will be providing Application Form Last Date information as well. The correct, precise and easy to follow steps are given here through which you can fill up the form in no time and making the complete process simple for you. Open the link of website given here vit.ac.in. Use the menu bar and go to PG admission page. Once done click on the activated link of application form submission. Register yourself using valid credentials usable in long term. Check all that you have entered before submitting. After payment of application fees, VITMEE Registration Form your submission is complete successfully. Application Fee: The VITMEE Application Fee is INR 1121/- The fees can be paid online or in the form of Demand Draft drawn in favor of VIT University. VITMEE is the national level exam and therefore it is obvious that the exam would have a certain level of difficulty. Here we have given the VITMEE 2019 Exam Pattern through which one can know arrangement of marks and topics. The VITMEE Paper Pattern will also be helpful for applicants to improve their practice sessions. Marking Scheme: One mark for each question and no negative marking if wrong answered. The biology will be asked to applicants those who are seeking admission in B.Tech Biotechnology, B.Tech Bioengineering, B.Tech.CSE (in Bioinformatics) and ECE with special in Biomedical Engineering programs. Being a participant of the exam, each and every candidate wants his/her selection for sure. However as the exam is of higher level, it is not easy to manage scoring easily in the national level exam. Thus, VITMEE Syllabus 2019 pdf is a savior for all students. With all updated changes one can easily qualify best marks in their chosen stream. The syllabus will vary for different courses thus through subscription of the page you can get notified about the availability of VITMEE Syllabus for Mechanical, EEE, ECE, Biotechnology and all other streams. The Slot Booking is a crucial factor in all computer based examination as it permits applicants to choose the stream of their interest. The slot booking however again is an online process which will be functional on first come first serve basis. The VITMEE Slot Booking Link will be active within the given time period only. Also, the chosen location or any other kind of changes post process will not be valid. The VITMEE Hall Ticket as by the time applicants would have known that it is the most necessary document to be possessed by applicants during the procedure of examination to admission. Those whose applications fulfills the eligibility criteria can get their admit cards. For more convenience along with the date of availability VITMEE Admit Card Download link, will be facilitated. The announcement of result is made in form of VITEEE Merit List. Those who will give exam can expect to check their results announced in the month of June. Students can check their results online only as well as the authorities will send qualified candidates message. The result can be notified through the link provided by us earliest. Counselling is for all those aspirants who have managed to get qualify the examination procedure. The process can also be termed as an interview during which finalization of admission will be done. Counselling dates can be checkout from here, moreover, all qualifiers need to know that their selection will be accepted only if candidates appear in the sessions. More queries related to the exam can be resolved by putting questions in the comment box.